There’s been some changes to what’s called “upper Voltaire” – that stretch of Voltaire Street east of Ocean Beach, up on the hill and that flows down across Catalina Boulevard and onward across its bridge over Nimitz. 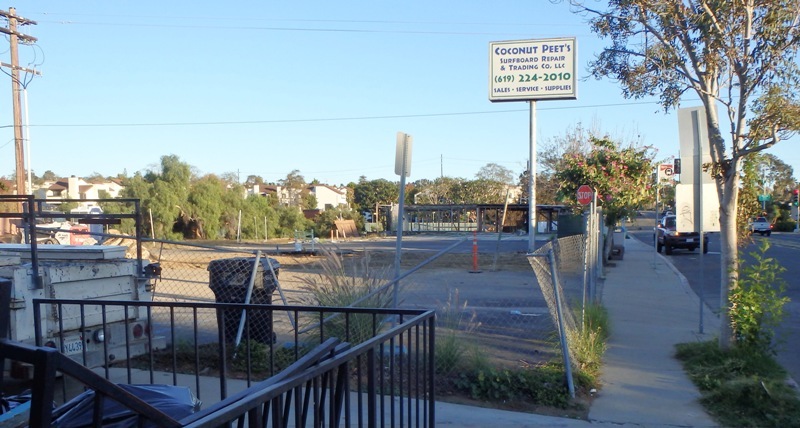 Former coffee cottage will be off-site kitchen for OB Noodle House. The old Dominos Pizza building (you may remember it as the surf shop) has been demolished and removed. There has been some general clearing of that lot. And next door, the former coffee house cottage is also undergoing an interesting switcharoo. 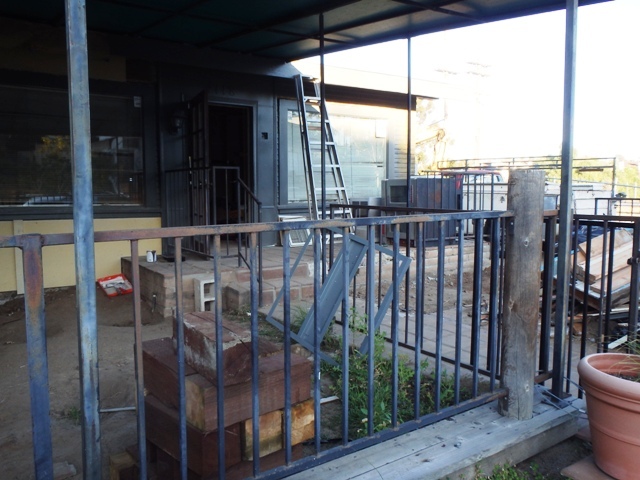 The former java joint is being turned into an off-site kitchen for the OB Noodle House. Wow – more expansion for one of OB’s most favorite restaurants. But the main thing that is going on is that the one-acre triangular-shaped lot along Voltaire where Dominos stood just west of Nimitz is beginning its transformation into a site for 28 two and three storied townhouses, and half a dozen retail units called the “Upper Voltaire Mixed Use” project, managed by Mike Stevens. It looks like local residents – some of whom remain very critical of this project (see below) – will need to anticipate increased traffic in that entire area, due in part to this new project, but also the general increase in businesses and restaurants and the new condo project at Voltaire and Catalina. Designed to bring in “quality townhome residences”, the units will include 2 or 3 bedrooms with an average of 1,450 square feet. 17 of them will be 3-stories and eleven are 2-stories that will rest over retail storefronts. All the planned units will have a deck, and some will have two, plus garage spaces. 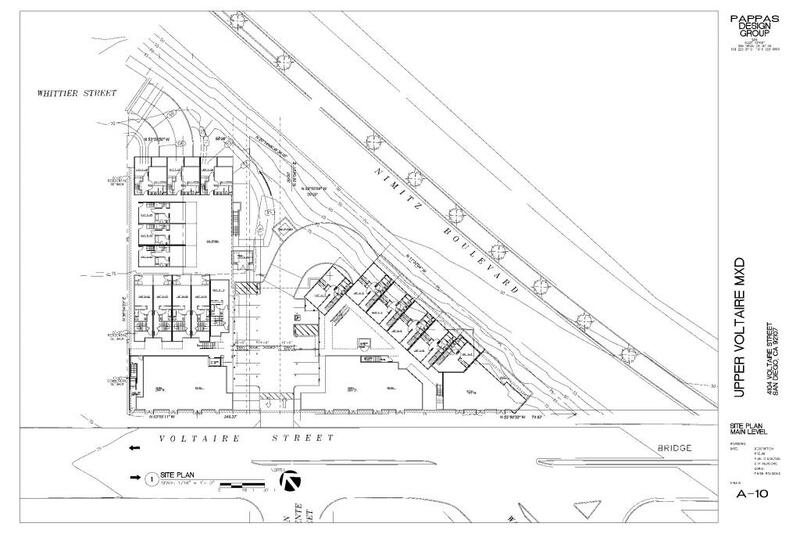 The project will include 6 buildings, with 3 of them having street-level retail spaces along Voltaire Street. Parking for commercial customers is a separate, at-grade parking lot behind the stores. The mixed use project has been delayed for numerous reasons, and was originally scheduled for grading, shoring and off-site improvement work during the summer of 2012. The vertical construction was planned to be finished by mid-2013. So, it appears to have been a delay of 2 years. The construction costs were estimated to be about $7 million a couple of years ago. The project boasts of having “garnered unanimous approvals by both the City Planning Commission and San Diego City Council,” and states that “the project site was designated a ‘Smart Growth’ location on SANDAG’s City of Villages Regional Plan.” … Our reliable source says that all the permits are current. This area of Voltaire had numerous projects planned before the Great Recession. It’s unclear what if any of the others will take place. But expect more traffic and more congestion along this section of Voltaire. All dwellings have one or two outside decks, 2+ parking spaces and a secure storage room in the garage. Two elevators access the garage, ground-level outdoor common areas and mid-level residential entries. Gated driveways exit the garage onto either Voltaire St. or Whittier Street (one-block from Catalina Blvd.). All residences will be sold at full market rate – the City’s affordable housing requirements are satisfied by payment of an in-lieu fee at building permit issuance. The project web site actually said that the project was “In full conformance with zoning and all goals of the Peninsula Community Plan. I will say that the Peninsula Community Planning Board did not agree. This project was appealed at each level and none of the appeals were successful. This overly dense project will dump most of the traffic onto dead end Whittier St. with the only exit being Famosa Blvd between Voltaire and Nimitz. We showed the city that the Level of Service (LOS) for Famosa was the lowest possible grade; the street was way beyond capacity. This fell on deaf ears. Traffic will also come in and out of Voltaire just east of Catalina, another street with a very low LOS rating. Also fell on deaf ears. I spent several days taking pictures of backed up traffic on Voltaire, Catalina, and Famosa and presented this in a Power Point presentation to the city to no avail. … We pointed out that there were several developments planned for these same blocks, another only slightly smaller one was approved across the street from this one. We asked the city to do a comprehensive traffic study to take in all the proposed projects. Nothing. But, the developer, Mike Stevens, said he was putting in bike racks and everyone thought that was just swell. Brace yourselves everyone who uses this intersection, it’s going to get a lot worse. This is going to be a disaster for the neighborhood. The only street access will be through two of the most congested streets in the neighborhood: Famosa at Whittier and Voltaire at San Clemente. I cannot imagine any changes to these streets to ease access to these units that would not make the congestion even worse. Whittier has a stop sign at Famosa/Catalina. That stretch of Famosa and Catalina between Nimitz and Voltaire is a main access road in and out of Point Loma for residents and commuters. Traffic already backs up from the light at Voltaire and down the exit ramp from Nimitz. Drivers turning left from Whittier Street have the lowest right-of-way at that intersection. It seems like developers are hell bent on turning Voltaire Street into a narrow canyon with 30 foot vertical walls on both sides, and traffic at a standstill. In keeping with tradition, our city government gives its rubber stamp to the whims of developers, regardless of the effects on the community. I can’t wait for these – finally those of us in working class families looking to own might finally make that a reality. I’m glad we passed the OB plan, but it came at the expense of the ability for many OBceans to own a property one day. I always pondered the irony of the “progressive” plan. 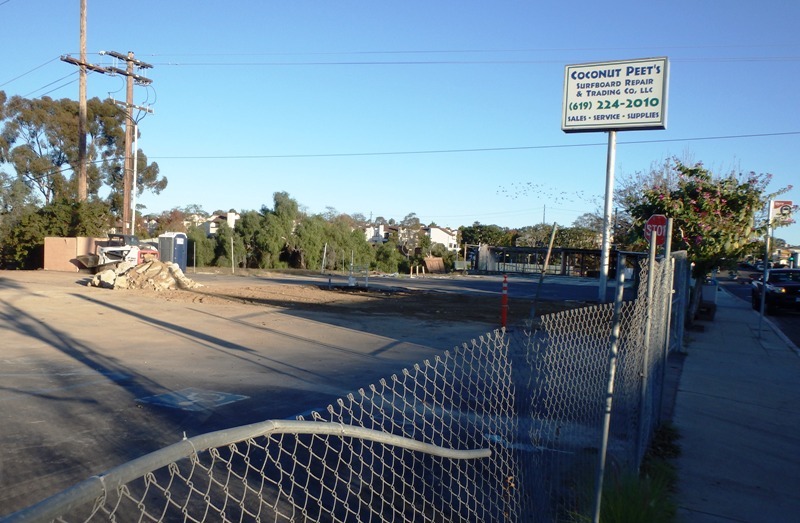 Tyler – Just to be clear – these units are outside the OB Community Plan Area and are in the Peninsula planning area. One of the central tenets to the OB Community Plan is the floor-area-ratio (FAR) of 0.70, a tool that OB planners have used for 40 years to restrict over-development, the development of more huge, 3-storied short term vacation rentals that actually decrease the units that are available for renters. Afterall, most OBceans are renters (6 out of 7). Totally, Frank. I get this isn’t within the OB plan and am with you all the way on your points…. within the confines of the OB Community Plan Area. While added density is NEVER convenient (I grew up in Bethesda, MD.. I know all about it), if you don’t let it happen one place you’re going to have to give concessions in others. Don’t bank on being able to afford one of these, Tyler. The ones at the corner of Voltaire and Catalina sold in the “low $500s” and you can expect these will too. As for the OB plan, I don’t think you fully understand what happened. The FAR ratio only applied to the high density zoning in OB, the RM2-4 zone, it has no effect on the other zoning. The reason people can’t afford to buy in the Peninsula is the value of the property. I have a very small house a few blocks west of this new development and its value is 90% the lot and 10% the house. It is the land value that is driving the costs up. Not going to discuss finances but that’s a fair range. A couple years ago that would have gotten me a SFH within the OB Community Plan Area, but those sames properties are pushing $750k plus, now. Part of that has to do with greedy investment property owners and STVRs.. and some of that has to do with keeping OB OB and not allowing extra development and density. Even though I’d love to buy a home in OB, I’d rather it stay the way it is. 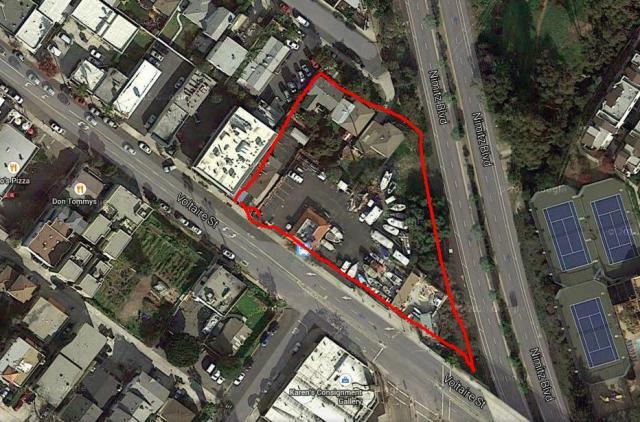 But when it comes to Point Loma and the areas just outside the OB Community Plan, I have less qualms with added density. As I mentioned above, I grew up in a town that exploded in density in certain areas. It’s never convenient and you hate to see some of the “old way” gone, but it’s a necessary thing. If we don’t add new properties, the new generation of families will never have a chance to grow a family on the Peninsula. There is a perception that the OB Community Plan has kept density out of OB but that is not really correct. The only area that has a FAR restriction is the zoning I mentioned already and that only works because somehow the .70 FAR was put into the Municipal Code. I have no idea how it got there but that is the reason why it has teeth, community plans, admirable though they may be, are toothless. The .70 FAR only affects the one zone. Development is coming to OB. The project on Abbot and Saratoga at the beach is an example. The southwest corner of Cable and Santa Monica is going to be completely redone. One family owns a bunch of Newport where three story mixed use buildings will be the norm. Building for density in an area as pricey as Pt. Loma will not result in affordable housing, it will just be more expensive, densely placed homes. The peak hour traffic is from the military jobs at the end of Catalina not from building projects. The traffic on Voltaire is school traffic. A student going through K-12 goes to four different schools. Parents with multiple students of slightly different ages are constantly on Voltaire between Dana, Correia, and PLHS. Have to disagree RB. The military traffic generally just goes north and south on Catalina and it is not the problem. There is plenty of room to queue traffic to the south, not so much the north. A lot of the traffic on Voltaire is schools but it is also a lot of commuters heading for the Nimitz north or south entrances and exits. The traffic from the new development will all be trying to turn right at Whittier and Famosa and Whittier will be completely backed up. Same problem with traffic entering Voltaire. We tried to get the developer to build an entrance and exit from the underground parking onto Nimitz with no luck. They are excavating down that far for the parking garage. This is just me speaking for me as an OB resident just a few blocks down from this project (near Collier Park). I travel up and down Voltaire every day. I love the continued improvement of Upper Voltaire with more opportunities for people to live and a more walkable feel. What you call “canyon” Frank, I’d call a sensible, walkable urban environment. I like this and wish them well. I also agree that the stretch of road just west of this is risky for bicycling but mostly because the speeds on Voltaire are out of hand — that does not indicate a traffic congestion problem — quite the opposite. P.S. Please, please put a crosswalk at Froude and Voltaire. Thanks for the sharing, Scott. Just for the record, it was a local whom was quoted as calling that stretch of Voltaire “a canyon”. I don’t know what time of day you travel Voltaire, Scott, but for much of the day, it is congested. I live down the street from Collier Park and have been using that intersection for 28 years. This new development is too dense and will cause problems. But, perhaps you don’t know the whole story. Directly across the street from this, another project is waiting to be done, only slightly smaller. Down across the Nimitz Bridge on the south side, another project is waiting to go. Walkability is great for people who live right there and can walk, but the Peninsula only has a few ways in and out and Catalina/Voltaire is a major way in and out for people who don’t live near this area. The intersection is a mess already and will get much worse. I like the changes of this area compared to what was there. I hope there are few cafes that follow which are locally owned and skip any more bars in this area. It’s time to have some speed monitors on Voltaire and slow down the traffic for those that bike and walk this area. YES! on that crosswalk idea. Building more aint gonna make things cheaper..Look at Mission Beach they just keep building and prices keep going up. The traffic in that area is already a nightmare it can take 3 green lights to make it one block now. Traffic on Voltaire could be backed up to the High School…1/2 hour to go 4 blocks?…And yeah as a cyclist that stretch of Voltaire is SCARY. Plus the potholes at Voltaire and Catalina as you are coming down the hill add to the adventure….As long as people keep coming here thinking it is going to be nothing but palm trees coconuts and sunshine they will pay the price…. Nice to see that area getting the makeover it needs. It’s been way to long. It will be a nice walking neighbor hood I hope. The traffic is bad at school time but at 10AM not so bad. The busses are there to and they ran pretty much on time when I rode them. What ever is put there will be better than a vacant lot. It is nice to see an urban area redeveloped. That’s good city growth. Do you live in this area? Do you use the Catalina Voltaire intersection regularly? 10AM the traffic isn’t so bad? Where IS traffic bad at 10AM? Sounds like a PR plug to me. Several blocks away, Guizot. Go by that intersection several times a day for 30 yrs. Seems like you are kind of Banana (Build Absolutely Nothing Anywhere Near Anything). That’s no progress and no growth. Cities need growth or they die and become slums. Older Article: Can Our Children Learn to Study War No More from Mice?